Labelled "Made in Tasmania, HORIZONTAL. ". Made from solid close grained Huon Pine. 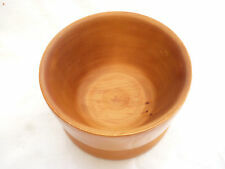 Attractive turned wooden bowl. Nice finish, colour & "Bird's Eye" marks inside. Side Screw needs refitting and a piece of veneer is chipped. I turn mainly rimu – the red wood of New Zealand. MAY HAVE MINOR SURFACE MARKS. Our bookshelves are disinfected at regular intervals with anti bacterial spray. Most issues can be resolved amicably through positive and honest communication. PINK WALNUT BOWL & LID, made in Port MacQuarie in 1976. labelled underneath "Pink Walnut Port MacQuarie 1976.". Labelled underneath "R G Rutherford Orange NSW '82". CHERRY SUGAR BOWL /DISH with lid. NICE OLD WOODEN TURNED CHURCH COLLECTION PLATE WITH VELVET LINER. With nice grained & coloured timber. 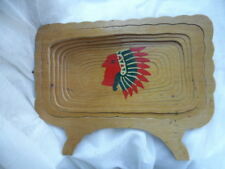 Attractive large turned bowl on stand made. the base can be removed if desired. 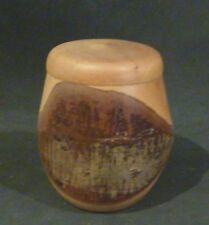 or 8cm high without the base. WHITE CEDAR?. CAMPHOR LAUREL?. BOWL & LID. beautiful grain and lustre, and the design shows the beautiful texture of the bark, as well as the grain of the wood. DETAIL HAND PAINTED POKER WORK. SEE PHOTOS FOR BEST GUIDE TO CONDITION. Its classically Russian. Beautifully hand-painted, wooden lacquer folk art bowl. Silver painted on the inside. Price reduced and negotiable within reason. NO MARKS ON THE BACK RE WOOD [LIGHT WEIGHT]OR THE MAKER - SO AGE AND ORIGIN UNKNOWN. 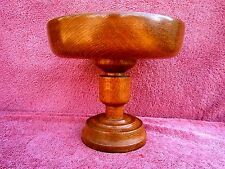 VINTAGE SMALL WOOD PEDSTAL BOWL 12cm. BY 11cm. TALL AND 11cm. ACROSS THE TOP AND 6cm. ACROSS THE BASE. BOWL IS 6cm. NOT SURE OF THE SPELLING ON THE SIDE - AGE AND ORIGION NOT KNOWN. Its classically Russian. Beautifully hand-painted, wooden lacquer folk art bowl. Gold painted on the inside with green and white flower motif and perfect black rim. This Antique Rustic Hand Carved Wood Bowl with Handle. Nice condition for his age. Interesting despite the crack. Color Wood. Primary Material Wood. Consider the above to avoid misunderstandings. Age Unknown. Unusual wood Bowl with glass beading, 1880-1890th mass: approx. 11.3 x 5.5 cm. JUAN DE LA CRUZ SAAVEDRA. Maker JUAN DE LA CRUZ SAAVEDRA. DRIFT, TREE ROOT WOOD SCULPTURE OF A WOMAN SITTING HOLDING A BOWL. Hand carved with nice details. Really Beautiful Piece- Wood feels smooth and warm to the touch. Antique Primitive Very Large Rectangle Hand Carved (Hand Made) Single Strong Solid Wooden Trencher Dough Bowl 18 century. CONDITION: in excellent condition for its age! Wooden Bowls Plates. Felt inside Base (11.5 cm). 23.5 cm Circumference.